The following articles have been written by Vix Lowthion. 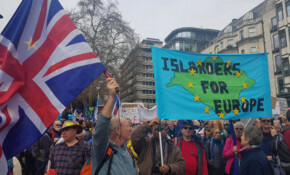 Over 100 Islanders watched the front of the march set off at midday, and they were still marching through central London at 5pm. Report, photos and video within. Local councillor, Daniel James, said the West Wight deserves much more support from the Isle of Wight council who he believes should go back to basics and properly support rural Island schools. The mood of the meeting was anger and disbelief, with huge cheers and rounds of applause for those who stood up to speak and question the decision by Isle of Wight council officers to focus on the future of one school only. Cllr Medland has called into question the process of how the Isle of Wight council proposed to close All Saints' Primary School in Freshwater. He said the "policy is riddled with contradictions", with "no central strategic sense or awareness of the role of public services". Vix Lowthion says that whilst wildfires have raged across the UK in East Sussex, Edinburgh and Wales, the Isle of Wight MP's "silence is deafening" on the issue of climate change and the Government's progress on achieving net zero carbon emissions by 2020. There are just a few more days to have your say on the draft Island Plan, which Green Party councillors from across the Isle of Wight town and parish councils say "must serve the needs of Islanders and the planet". Link within. Inspired by the actions of 16-year-old Greta Thumberg in Sweden last summer, this year up to 70,000 schoolchildren in 270 towns and cities worldwide have taken part in ‘Fridays For Future’ to demand that politicians take action to confront the Climate Emergency. Vix Lowthion says that whilst Theresa May’s government has completely lost all ability to govern, ordinary people continue to suffer the unfairness and inequality, instability and disruption. Vix Lowthion says every single child in our schools is being affected by "these appalling cuts to SEND education support for our most vulnerable and isolated young people". She joined others calling for more government funding. Meeting fellow Green Party councillors from the Isle of Man at the party Conference, Vix Lowthion said they discussed the distinct Island identities and why Green policies really speak to the respective communities. This investigative documentary by John Christensen, Director of the Tax Justice Network, will be screened in Newport early next month. In five school years of parents (2018-19 intake) having to drive their children to school because there are not enough places on the school bus will result in 390,000 extra car journeys on the Isle of Wight says IW Green Party.